In 2017, the QRAA theme was ‘Iconic Queensland’. Queensland is rich with iconic structures, people, locations, events and lifestyles that shape the State’s identity. Artists were invited to consider the unique and iconic elements within their own regions, to produce works that reflect our diverse Queensland communities. The theme was to be addressed in an accompanying artist statement of 100 – 150 words. All entries were eligible for the $10,000 Flying Arts ‘Art for Life’ Award and for selection in the touring exhibition. Creating dribble castles of sand from an early age has ignited in methe love of sculptural forms made possible in nature.Anthropomorphic figures formed in the sand as it ran through myfingers resembling classical bodies set in stone.Like mangroves sprouting out of shallow water, The Sandmen Seriesdeveloped from looking very closely at the small things that to meare an iconic representation of life and community on the coastlineof the Moreton Bay Region. Sometimes the iconic images that define a place can best be identified by looking beyond grand monuments and gestures, and instead amongst the banal repetition of the humble, every-day rituals undertaken by its residents.When I moved into my Nana’s house in Rockhampton a couple of years ago, one of the things that fascinated me, as a recent arrival to the area, was the regimented and fervent passion for manicuring lawns and gardens. Every weekend, a dissonant orchestra of lawn mowers, leaf blowers and whipper snippers comes to life and fills the street, before being replaced by the comforting tick and whoosh of sprinklers and hoses. I’ve depicted Nana performing this iconic suburban Queensland weekend ritual of watering the back garden, using watercolours to evoke the early morning light from the summer sunrise drenching the lush green lawn, and the depth of shadow amongst the subtropical plants. The reason why I make art is because it not only makes me happy,but others too. If I can inspire or brighten up someone’s life, it’s wellworth my time and effort. I am very much into fashion, so whenI saw that the theme was Iconic Queensland, I instantly thought ofthe typical Art Chic look: highly trendy, can pull off a short fringeand loves fashion!Everyone knows at least one alternative girl. Maybe she’s not evenan artist, but she is very much in tune with her feelings and howothers are feeling. She is very open-minded and non-judgmental.Friendships are really important to her and she can’t live withoutmusic.The Australian bush flowers I have chosen mean: perseveranceand willingness to try; strength and courage to cope; renewsenthusiasm, endurance and inner strength; self-approval andacceptance; and releases fear of rejection. Votive is a selection of works made during my residency at theGympie Woodworkers’ Museum in February 2017.The history of the timber industry is most recognisable as aQueensland icon. The work was originally created for the old milloffice at the Museum, as an installation based work. The austerityof the building reflects the hardship of pioneering days.It was the absence of the feminine that drew me to the office. Votivespeaks of stories omitted and overlooked. The subtle differences incolour, due to age and materials, reflect the unspoken experiencesof colonial women.The doilies and lace remain remnants of their struggle andtestament to the obsolescence of sentimentalising and isolatingwomen. Float is a print performance quick-paced as an edited video. Itstages a connection between an arguably iconic regional backyardin the former coal mining region of Ipswich and the iconic Great Barrier Reef.Under a fairy-light draped clothes-hoist, a tropically decorated swimming pool is set up. Onto the surface of the pool’s water,the artist dry screen-prints Ipswich coal dust to create a floating image of the Queensland coastline, the Great Barrier Reef and thelocation of the Galilee coal basin.This image is then changed by water currents and actions of the artist to extend the meaning of the work. This artwork is a personal metaphor that signifies our waterways and their importance in the survival of life in Regional Queensland – the reds underpinning as the blood of life, black as all that is and white, the sacred and spiritual essence of such places.This framework developed as a result of several different amazingexperiences at various regional waterways. Each waterway has the wonderful ‘Wow’ factor about it – a sensation that gave me a senseof being refreshed and alive.There’s a universal message: when humans respect, nurture andlook after our waterways, we benefit with life. This message is often demonstrated in the stewardship of our environment and is a subject repeated continually throughout historical, political,social and cultural circumstances.Our waterways are the life of Queensland. Fish: an icon of simple beauty and diversity. As an artist I seek the simple and most direct methods. As a printmaker, I have adopted the Japanese printing technique, GYOTAKU, using real fish as theprinting plate which reveals each species’ uniqueness.Inking then rubbing, transferring a whole fish onto rice paper, I amentranced by the biological details that each print reveals. Their scales and fins show how eternally prehistoric they are as ourliving ancestors.Diving amongst coral with fish shimmering in shoals, the ocean’s underworld is revealed as a beautiful experience. Noosa’s points are steeped in Queensland’s surfing history and culture. Geographically and culturally, Noosa is an icon of our great state – so iconic that it’s recognisable even from an elevated perspective rarely seen by those who visit and surf there. In our local region (an hours drive away is local when you live rurally!) there is a magical little spot near Maidenwell, called Coomba Falls. The place is incredibly picturesque, with a small waterfall flowing off granite cliffs into a deep swimming hole. Now while I was mesmerised by the falls, it was something else entirely that captured my imagination: the hand carved stone steps leading down to them! Carved from the natural stone found there, they are a work of art in themselves. Each step is delightfully unique. What could be more iconic than a place such as this? A tourist attraction for miles around! Coomba Falls blends the beauty of the natural world with the beauty of dedicated craftsmanship, into an enchanting whole. I believe it is these local wonders that are the true icons of regional Queensland! Rain Fields is a series of digital images that represent my home inthe Scenic Rim, where rainforest meets hot sun-burnt fields.Layered techniques of digital drawing mimic more traditionalstyles. With manipulated photographs of classic rural Queenslandgates and field scenes, collaged local flora and fauna, farming andworking animals, these images represent that meeting point ofmainstream and personal symbolism. The Queensland coast is synonymous with beautiful landscapes and one of the many draw cards to our state are the majesticwhales on their yearly migration. This is a spectacle that bringsmagic and awe to all those who witness it.This piece uses a fine liner in pointillism style and is overlaid with loose watercolours to evoke the peace and calm of the deep oceans off the east coast of Australia and these enormous gracefulmammals who call them home.It serves as a reminder of how special and precious our natural environment is and how our actions inland can affect our oceans. Strength of materials equals the bond between its particles. The finer the particles are, the less gaps or pockets of air exist -the tighter the cohesion is, resulting in a unified harmonious entity. 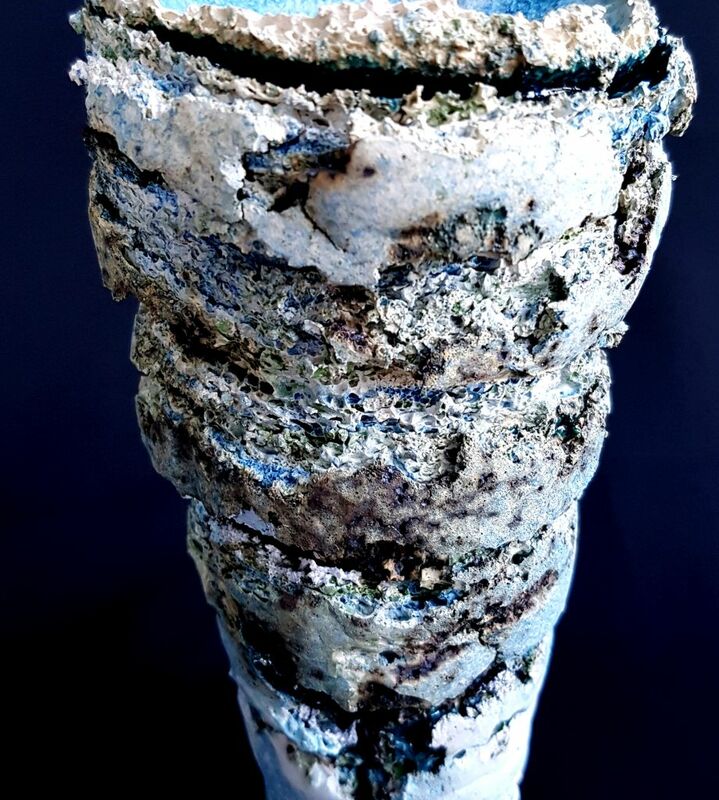 Recycled white clay finely ground and sievedwith the addition ofnumerous oxides were used to build and colour the layers of this vessel. Handbuilt, painstakingly slow and laboriously demanding- the task of meshing those fine particles together echoes the delicate,measured and challenging task of building one cohesive society under the blue sky of this state of QLD. The strength and durability of this vessel is to be measured by the understanding and forgiveness one allows for self-definition and the freedom of existence of a work in progress unit. Being strong yet fragile, cohesive yet individual. The strength of materials equals the bond between its particles and the finer the particles are, the fewer gaps or pockets of air, the tighter the cohesion is, resulting in a unified harmonious entity.Recycled white clay, finely ground and sieved with the addition of numerous oxides, were used to build and colour the layers of thisvessel.Handbuilt, painstakingly slow and laboriously demanding, the task of meshing those fine particles together echoes the delicate, measured and challenging task of building one cohesive society under the blue sky of this state of Queensland. Water, colour and light define my artwork, both in mediumand subject. Landscapes, still life and portraits can all changedepending on the light in which they are viewed;l the light defines the shapes and creates the atmosphere. It is then my challenge to capture this light and atmosphere in my painting.In Going Home I have depicted the iconic Queensland outbackatmosphere that I have experienced in our travels, out pastLongreach, in the drought a few years ago. Vast open space with little vegetation, dry, hot and hazy horizons, and the feeling of desertion, juxtaposed with the feeling of belonging and comfort a great home can offer. These delicate, iridescent blue butterflies are a popular emblem of tropical Queensland. Often seen floating under the rainforest canopy and through suburban gardens, these creatures represent both the beauty and delicate nature of our relationship with the natural environment. Once abundant, these butterflies are now suffering from a mysterious decline in numbers, with many breeders experiencing significant losses of the animal during the caterpillar stage without any obvious explanation. This artwork was created as part of a larger series, “Butterfly July”, a daily painting practice that allows me to continue to develop my painting skills and open my eyes to the many stunning varieties of butterfly, their life stories and the importance of projecting vulnerable species. The delicate Queensland seahorse is only found in inner reefwaters of the Great Barrier Reef. Seahorses reside in the shallowwaters of the continental shelf, feeding and finding protection inseagrasses and coral reefs.Unusually, they are one of the very few species of fish that swimupright, using their dorsal fin to propel themselves, however they are often found with their tails wrapped around coral and otherobjects to stop themselves being pulled by the currents. The male seahorse incubates eggs and after about two weeks up to 1,500 baby seahorses hatch, each one measuring a minuscule 5mm.This artwork was inspired by a previous painting series I undertook, titled Underwater April, a daily painting practice that allowed me to continue to develop my painting skills and opened my eyes tomany wonderful and weird denizens of the sea, their life storiesand the importance of protecting vulnerable species. This work reflects the unique and iconic elements of the GladstoneRegion and the growth of artistic communities in regional areas.They crop up in unexpected places, in not always the mostfavourable conditions for an artist – amongst industry, mining, transport … after boom towns have erupted and exploded.While economic and social structures resettle after a fast and furious growth, artistic communities thrive and grow. Amongst thewarehouses and factories, on the docks and within the shipping containers themselves, artistic communities develop organically and quickly, and help sustain the communities they belong to.Gladstone is a port city, a hub for trade and transport and a locationknown for growth and development in industry and mining.Shipping containers are symbolic of the discarded and re-purposedmaterials and spaces reclaimed by artists.They are a reminder of the communities that continue as the dust settles around. Away 2 is the second in a series of works created as a response to my return to Mackay after 30 years away.On the long drive from Brisbane, the southern landscape changesdramatically from grazing land to sweeping cane fields, distant mountains and glimpses of the turquoise seas, before transforming magically again into the iconic ocean vistas of the WhitsundayIslands and luscious Eungella Ranges.Memories of the area are vivid and remain indelibly locked in my psyche, emerging in dreamlike metaphors such as this work, reminiscent of place and experience. Rising upward and towards Mt. Nebo is our iconic Goat Track.This track was opened 95 years ago connecting the Valley to Mt. Nebo. It is believed to have been built in the 1920s by returned servicemen living in nearby soldier settlements. The track they were opening went through mountainous rocky terrain and wouldhave been back-breaking work with only picks and shovels.The Goat Track had been used by the public but was devastatedby flooding rains in 2011 and not reopened until 2014. At thereopening of the track it was said, Now the public can relive thosehistorical steps taken by former soldiers all those years ago.The track has always been a gravel surface and this is in keepingwith the iconic nature of the area, portraying the strength andfortitude of those returned soldiers. 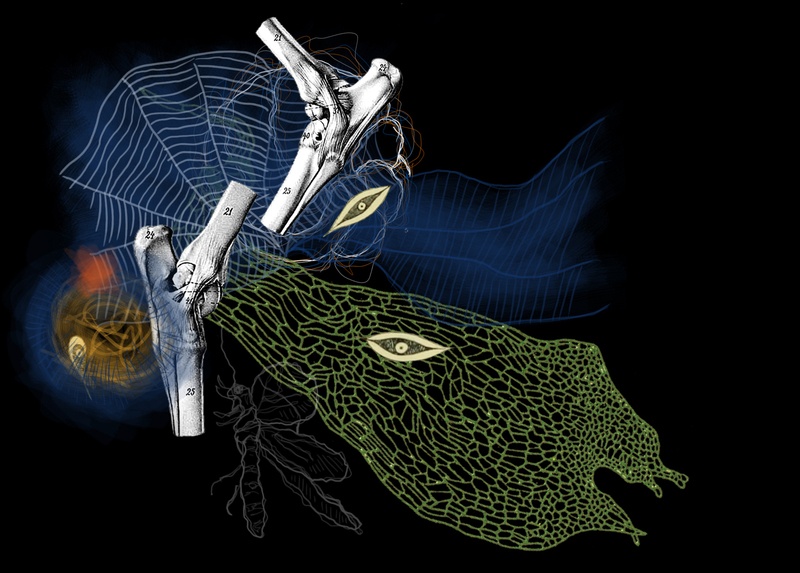 What if we could see sound?This artwork is a visual interpretation of the astoundingly noisyracket made by the iconic rainbow lorikeet. This blue headed littlebird is a Queensland icon and features in millions of tourist snapsand memories. They look beautiful and sound unforgettable. They are popular residents in Mackay, often photographed hitch-hiking on top of the sugar trucks.When I think of my home, I think of Mackay’s main street at sunset where you are treated to a spectacular performance by hundreds upon hundreds of rainbow lorikeets. The noisy little parrots are almost deafening as they compete for the best position in the stately palms that grow down the centre of the street. Add to that a striking sunset and gentle ocean breeze and you can’t help but see their noise streaking the darkening sky. The jewel of my community, the iconic Bremer River, is our unique treasure. More days than not, the Bremer delights as a shimmering ribbon, lazily adorning our home, shaping us into an iconic Queensland community. However, the devastation wrought when the Bremer floods also shapes our community.Living with a river can bring both delight and terror, as many haveexperienced in Queensland’s regions. When the water recedes, we rise up, we rebuild and in the process we connect.In my homage, Delight & Terror, I have used water from the BremerRiver and a technique that deliberately forces a loss of control,allowing the water to find its own path on the canvas. This is a risky process that results in organic, natural markings beforefurther elements are created with intent and precision. The spirit of dance, Girrelau Marr, is a depiction of a spiritualimage capturing what’s involved in the mind of a warrior dancerperforming his traditional dances.It transports us to a state beyond words, our bodies become the essence of the dance; we are an extension of, and in sequencewith, the rhythms of the drums.The songs command our spirits; we are carried along through different dimensions until we become the dance; young warriors who hold lightening in our hands, understanding the essential of spiritual powers that is the Zugubal’s (spiritual ancestor’s) universein the stars above.We are connected by rhythms to the spiritual eye of our ever watchful kuikumabaigal (grandfathers). This work was created after a conversation with award winning, Queensland author Inga Simpson, prior to her (recent) release of ‘Understory, a life with trees’. It combines basic stop-motion processes with large, hand-drawn charcoal drawings. The changing scenes explore the seasonal movements of growth throughout the life of this important rainforest tree found in my locality. It is used in plantings to replace the weedy and invasive Camphor Laurel trees as part of Landcare programs to protect native species.The challenge was to interpret a few pages of text provided to me by Inga; it featured a brushbox tree visible from her window and her relationship with trees. I imagined being the life of this tree, responding to the moon, sun, rain, changing temperatures, the earth and the touch of human hands gathering ‘my’ regenerative seeds and the touch of ‘my’ leaves against the glass window. Steady economic progress and the dream of owning beachfronton the Coast has shifted noticeably from temporary to permanent housing: from gunyah, to beach-shack, to modern home. Yet colourful childhood memories draw us back to our grassroots.I am fascinated by our grassroots culture where stories, myths, and fables reinforce our independence while securing connections for safety and togetherness. I respond to Jack Zipes’s notion of how rebellion, resourcefulness and the art of subversion in fairy-tales creatively project our evolving needs.Beachfront Smoke House retells the tale of The 3 Little Kids livingon the beachfront, where stronger safer coastal housing results in living happily-ever-after. And there’s a moral to every story, it’s eat or get eaten!…and then the hungry wolf plunges down the chimney intothe cooking pot sending wonderful aromas throughout theneighbourhood. In joy we swung on the backyard Hills Hoist,singing merrily, WHAT’S THE TIME MR WOLF? Nothing quite says iconic Queensland to me like wide verandasand high set homes, commonly referred to as a Queenslander.The Street Series is constructed entirely from locally salvagedmaterials. Whilst this piece depicts a fictionalised street, thebuildings are all based on real houses in my home town of Ipswich.Each image is printed onto vintage newspaper discovered beneath lino floors when friends and family were renovating. Every image is then painstakingly hand cut and glued to short sections of VJ cladding, which was rescued from a site where three lovely old houses once stood.Using materials collected from Queenslander homes allows me to create pieces which are regionally specific and speak to anyonewho has lived in and around these iconic buildings.This piece is titled Hatches, Matches and Dispatches, which is what my Nanna called the Births, Marriages and Deaths columns of the paper. This work is a nod to the community of can-do individuals ofBlackall, and the vastness of the environment they find themselvesin.Just like the country which inspired the work, timeless, endlessand awe-inspiring, there is no horizon line or point of reference,each small piece forming part of a greater whole. Held together by deceptively strong threads, stitched in homage to the localwomen, the quilters, the fabric sewers, the craft makers, and thefamily menders.The work pays homage to the patchwork of the female charactersthat form the fabric and the backbone of all small outbackcommunities. These strong, honest, funny and generous womenare my Iconic Queensland. This work reflects the unique and iconic elements of the Gladstone Region and the growth of artistic communities in regional areas. They crop up in unexpected places, in not always the mostfavourable conditions for an artist – amongst industry, mining, transport … after boom towns have erupted and exploded.While economic and social structures resettle after a fast and furious growth, artistic communities thrive and grow. Amongst thewarehouses and factories, on the docks and within the shippingcontainers themselves, artistic communities develop organicallyand quickly, and help sustain the communities they belong to.Gladstone is a port city, a hub for trade and transport and a locationknown for growth and development in industry and mining.Shipping containers are symbolic of the discarded and re-purposed materials and spaces reclaimed by artists.They are a reminder of the communities that continue as the dust settles around. Granny’s house, an iconic Queenslander, became the heartbeatto my family gatherings. 29 Minnie Street was blessed with the happiest memories, cultural teachings and stories being passedon to the next generation. With her passing, she took a lot of traditional knowledge and skills, one being the art of the basketweaving.I came to realise our Elders carried knowledge and they embodied a wealth of wisdom and experience of nature gained over millennia from direct observations which has been transmitted overgenerations.I have used the actual traditional yellow dye used in basket weaving as watercolour in my drawing. I have re-used one of our old kitchen cupboard doors, reminiscent of the Queenslanderkitchen interiors, to frame this story.Learn the Weave continues our traditional practices. Western Queensland, with its never-ending plains, makes up alarge part of our state. The immense space of this place is serenelybeautiful, but also harsh. The isolation, the drought and the heat,require resilience from those who live there.Hanging your sheets on the line, week after week, shows adetermination to survive. In my painting, the sheets are out to dry, and the clouds may hold some moisture, but it’s not going to rain today.Maybe it will soon.I have often been struck by the thought that floating sheets takeon the shape and character of clouds, that they could just drift upand join the clouds moving overhead to travel to some new place beyond the horizon, where it rains and life is not so hard. This work explores notions of the iconic through an architectural and ecological lens. By looking through a Queenslander window,the work houses a series of panels evocative of stained glass, depicting images of diverse ecological systems in my region. The imbued feeling of stained glass underpins the conceptual idea ofconstructing a narrative.This story tells my tale, viewing nature as an icon and revealing howI perceive its power to create a place of wonder and reverence; and most importantly how it stands as a marker to my sense of home.With nature as the protagonist in this story however, it is one ina state of flux, with human interventions being the leading causeof change.The four corner panels depict the Cooneana Olive, a criticallyendangered plant species endemic to my region, to remind us ofthe ephemeral nature of an icon. This portrait of Carone is one of 32 portraits collected in my projectForeign Land featuring portrait film photography and related writtenstories based on interviews with migrants from the community of Bundaberg, Queensland.The project as a whole represents the broader migrant trends thatoccurred in Australia since the post war years. The works share the stories of people who have arrived from all corners of the globe, from southern Europe, to South East Asia, the Middle East, Africaand places in between.The works reflect the reality of migration, the success and happiness, the homesickness and loneliness, and take the viewer on an emotional journey as it explores multiculturalism and itsplace in regional Australian communities. My son put in a spectacular effort working a ridge at Fossil DigSite #1, outside of Richmond in the state’s north-west. Thiswatercolour study documents my son’s ultimate quest for theKronosaurus queenslandicus.Fossils won’t dig themselves out. Who knows if he could bestanding on the prize of his life?It was great to be outdoors in a part of Queensland we had never explored before. There is so much to see and do once you step out of your comfort zone. We camped rough and we also ‘glamped’.I completed this little watercolour study at the site in July 2017. We also gratefully acknowledge the support of private and corporate donors through our 500 Club. Bookings for the Iconic Queensland touring exhibition are now closed. Exhibition locations and dates will be announced soon. For further enquiries, email: exhibitions@flyingarts.org.au. View the winners and touring artists of previous years of the Queensland Regional Art Awards.